→How to check whether a website is Trustworthy or Not? Internet has really changed the Life of human beings on this earth. It allows you to Earn and Learn right from your House. Due to this reason, the number of websites and blogs on internet is increasing daily. So many websites are also there, who are making money on line by fooling naive internet users. If you are visiting websites which are related to Online Shoping, Online Jobs, Making Money On-line etc, don’t trust blindly on all of them. Today, i will show you “How to check whether a website is Trustworthy or Not?“. For checking the Trustworthiness of any website, i consider some important factors and use some important tools as well. I will discuss the same in this Post. You Might Also Like– How to get an Approved Adsense Account in 1 hour? 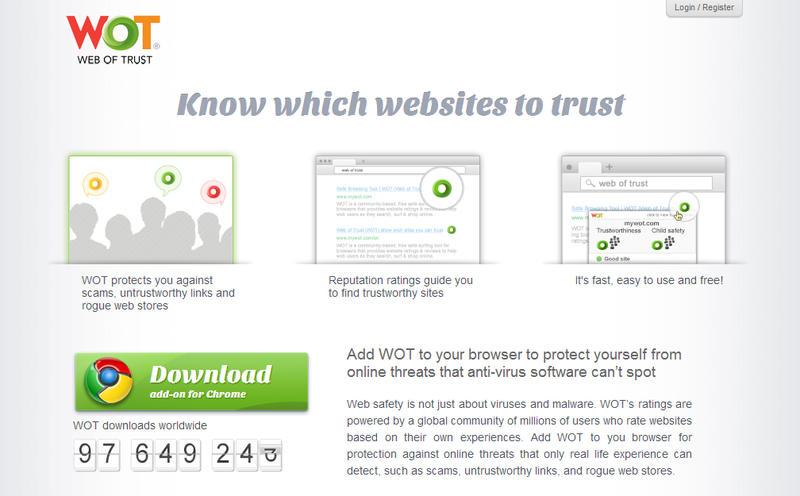 Most of the time, i use WOT(Web of Trust) extension for checking the trustworthiness of any website. It is really a nice extension for browsers like Google Chrome, Firefox, Internet Explorer etc. Read the below given intructions for installing and using it on your browser. Click on Download Add-on Button. I always use Google Chrome so showing the tutorial for chrome. Once done, You will have to fill the simple Registration Form. Just complete it. Once done, this extension will start working. To test it, search your desired keyword in Google. It will show many search results along with three coloured circles i.e Green, Yellow and Red. Red Circle indicates that the Website is a Scam. Green Circle Indicates that the website is Good and you can trust on it. WOT decides the trustworthiness of any website after considering the ratings of different users so you can trust upon it. Note: WOT shows best results for old websites only so you can’t judge a site or blog which is too new. It is one of the shortcomings of WOT. If you don’t know much about any website, You must check its Review in Google before investing any kind of Money on it. Suppose you want to check the Genuineness of website named “Magenet.com“, simply type “magenet review” or “Is Magenet a Scam site?” in Google search. If any site is old, you will definitely find lots of reviews about it. If you failed to find any review about that site, just leave because it is too new. Never trust any new site blindly. If you are reading this post, either you are a blogger or an active internet surfer. If i am right, you have already visited so many websites. Have a look on popular websites or blogs like Labnol.org, Shoutmeloud.com, problogger.net,mybloggertricks.com etc. What is common in all of them? If i were you, my answer would have been “their user friendly designs”. I always give importance to the designs of websites and Blogs. If a website’s design is not good at all, i won’t believe on it. You should always stay away from such sites. More than 1 millions such sites are present on internet which are fooling people. Note : Never Believe on Websites which appears too Good to you. Always remember- No one can give you thousands dollars for doing nothing or very small task like reading Email or typing 500 words. Apart from Traffic of a website, Advertisers mainly consider Alexa and Google PageRank before purchasing an Ad Space on a particular website. You can also use these two factors for checking whether a particular website is Trustworthy or not. I always use SEO Status Pagerank/Alexa Toolbar for checking these two stats of any website right from my Web Browser. Have a look on the Alexa and PR of Labnol.org which is a trusted site. If you don’t know already, PR score varies from 0 to 10. Note: If a website has Good PageRank, it is really a Good website but if it has poor PageRank, it doesn’t mean that the site is a Scam. In this case, have a look on its Alexa Rank. If it is Good, you can trust on it. Every Genuine of Good website provides information about its authors or Administrators. In blogs, you can find it either at the end of Post or at sidebar or at the Footer or in separate Page. If any website is not displaying the name or information about authors, stay away from them. It is quite logical as well. Writing anonymously shows that you want to hide yourself from your readers. Most of the times, people having bad intentions opt these kind of methods. I don’t know, how spammers or any other useless company knows your EMail ID but once they get your EMail ID, they starts sending lots of useless stuffs having links of their websites. If you are a new internet user, so many such EMails can distract your mind because they use titles like – “Earn $10 per Hour for watching videos“, “Earn $2000/month for posting Ads“,”Buy 1 Smartphone and get 4 Tabs for free” . Never visit any website whose links has been sent to you via EMail until and unless you know the sender. I am advising you because 90% of such websites are scams. My main motive for writing this post was to help new users, who always finds it difficult to find the Genuine websites. They want to earn huge money online right from the first day. When they come across scam websites, they think that those websites will change their life and they would be able to earn huge money. For only this reason, they invest money and later on keep complaining about those sites. I always apply the above written methods for checking whether a website is trustworthy or not. If you know any other method, let me know via comments. It would be interesting for me and other users.